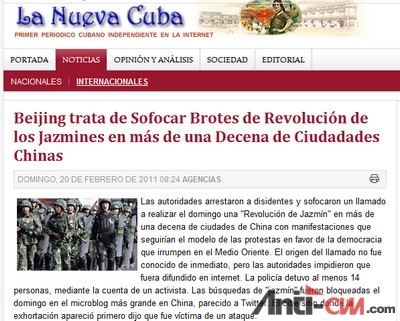 The website anti-CNN came into being because of the western media reporting about the Lhasa riots. 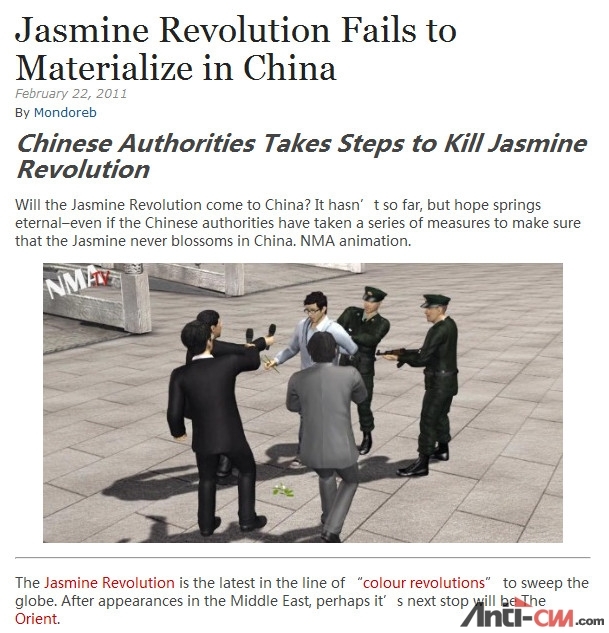 Here is a post from the anti-CNN BBS about some western media coverage of the so-called Jasmine Revolution in China. It is actually not difficult to find these fake photos. You begin with a suspicious-looking photo (e.g. 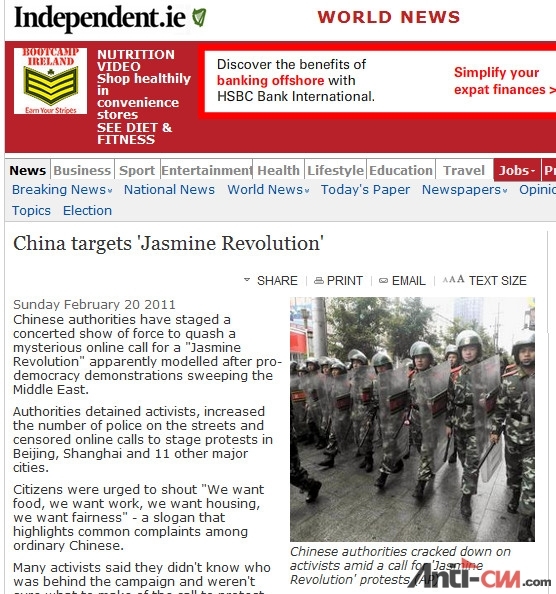 people marching down on a major thoroughfare when it is known that the Jasmine Revolution demonstrations were sparsely attended gatherings in front of McDonald's or Starbucks), you use a photo-identification site such as TinEye and you've scored again! 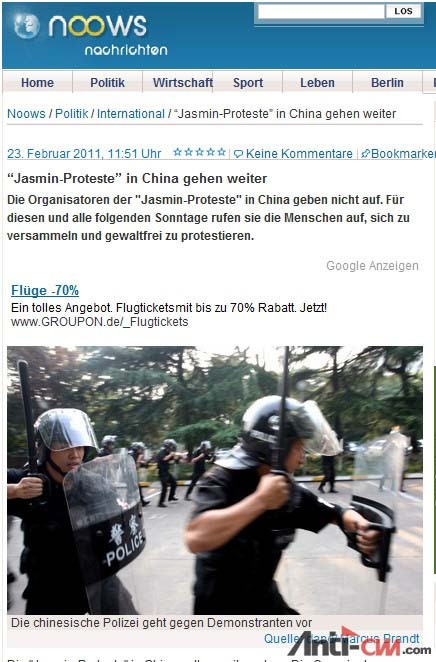 Using the Baidu photo identification tool, this photo was found to show an anti-Japanese demonstration that took place in Beijing in April 2005. The green placards with the word Taiwan in it indicates that this is a pro-DPP rally in Taiwan. 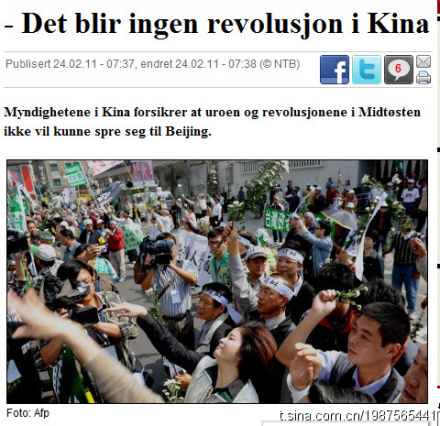 The demonstrators wore short sleeves, which is not probable in Beijing during mid-winter. The photo is credited to Agence France Presse. 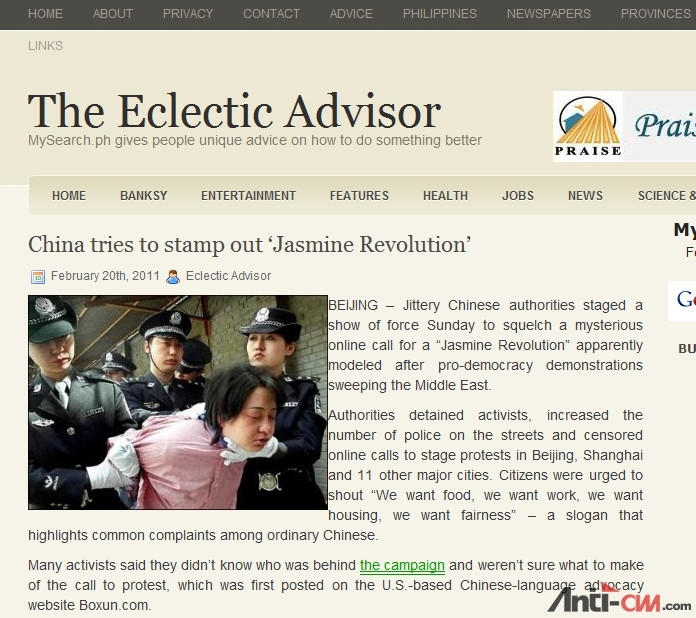 This Reuters photo was found via Tineye to come from an anti-Japanese demonstration in Lanzhou city (Gansu province) on December 24, 2010. 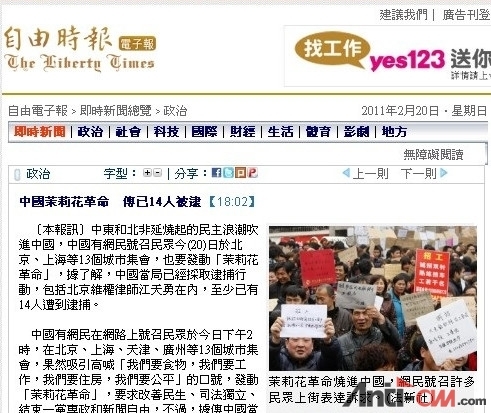 The people in this photo are holding placards with words like "Seeking workers" and "Hiring people", so this photo came from some job fair somewhere in China. This is an animated scene reconstruction, but it seems grossly exaggerated to have a policeman aiming a sub-machine gun at the arrestee. 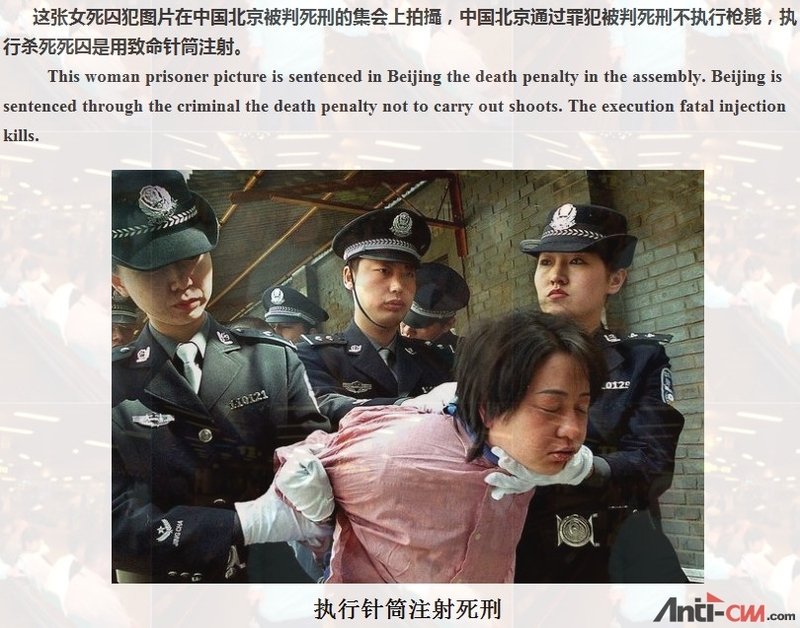 Among other places, this photo appears in an October 2009 RTHK report about the detention of Uighurs in Xinjiang. Wearing short sleeves in mid-winter? And where are the demonstrators? This Hong Kong police officer (note: they don't wear berets in mainland China!) 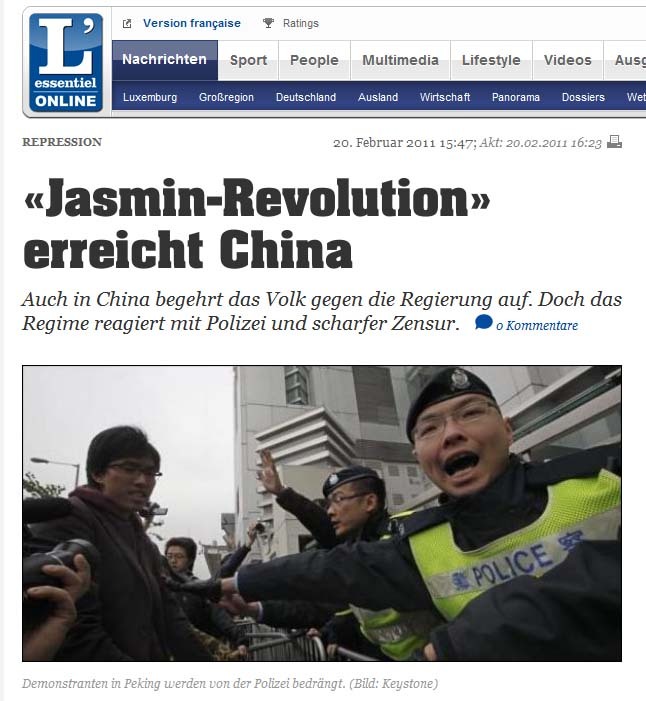 was re-located to Beijing for the purpose of photo-illustrating this written report. 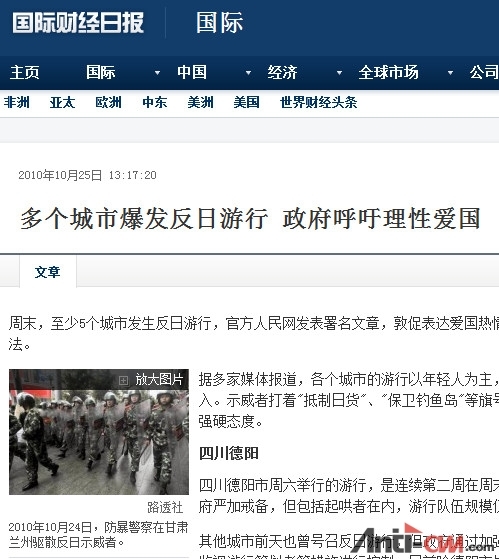 [ESWN comment: A Beijing-based foreign correspondent read this and said: "But I haven't heard of any of these outlets except Next Media Animation." That is not the point. 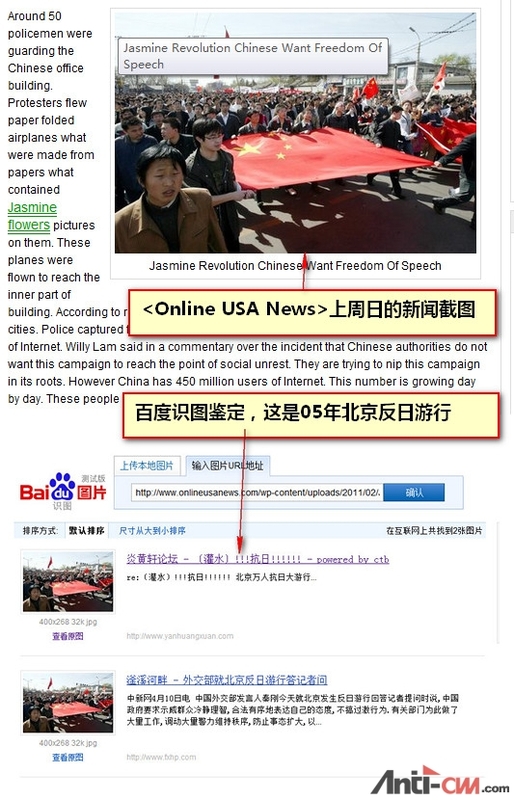 The point is that these examples are being circulated inside China as what "WESTERN MEDIA" do. That is, the malfeasance of a few is taken to be standard behavior among all. 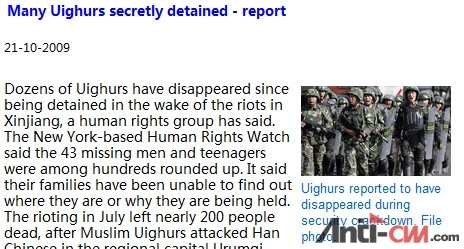 So will the rest of the western media stand up and denounce the few? If they won't, then it is case closed.